My name is Ibu Haria. I am 39 years old and I live in the village of Teluk Kanidai. 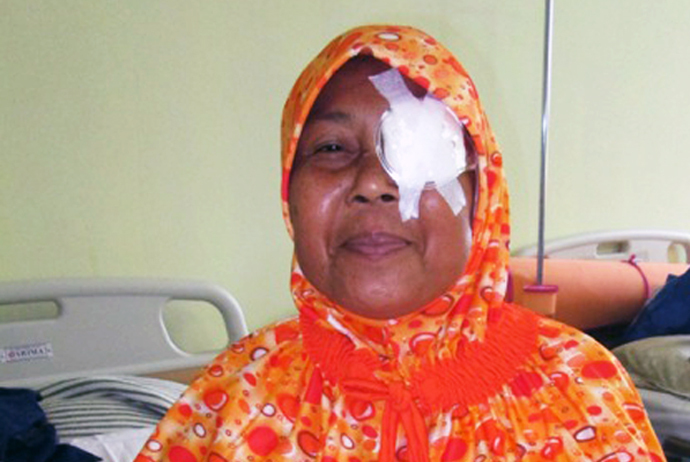 I suffered from cataracts starting in 2012. Because of my illness, I had trouble working and I was restricted in my everyday activities. The drop in my income significantly affected my family. Normally, I worked in a plantation and I tapped rubber trees, but it became too difficult. I had heard that cataracts can be fixed with an operation, but there were many terrible stories circulating from another village about the procedure. They said that your eyes would be removed from their sockets and that the “grey area” would be scraped away until it was gone. After this, the eye would be cleansed with water and then placed back in the socket. They even said that the eye would be totally soaked with water and scrubbed clean before being put back. I heard stories like this very often and it traumatized me. I decided that I would rather not have this surgery since it made me very afraid. Just the thought of it gave me the shivers! It sounded horrible. All of this changed when the team from YPP came to my house. They explained the way cataract surgery actually works, and it was totally different from way I had been hearing! They reassured me that this was a minor, safe operation and that I did not need to be afraid. Finally, after quickly praying for God’s blessing, I agreed to be helped by YPP and undergo the operation. Right now, thanks be to Allah, I am able to see clearly and go about my regular activities. I am able to work in my rubber plantation again and I help my husband support our family. Thank you Allah, and thank you YPP.